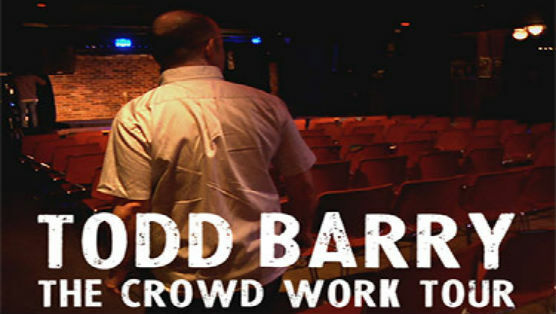 Whenever Todd Barry would call into The Best Show on WFMU (which was frequently), host Tom Scharpling would bring up one of his favorite experiences seeing the stand-up perform. It was at a comedy festival in New York where Barry had to do his set standing in front of a banner littered with corporate logos. For 40 minutes, he apparently did nothing but riff on the names and images behind him, and killed in the process. That’s how I knew that Barry’s Crowd Work Tour—a set of dates where he took the stage with zero prepared material, interacting with the audience and using his quick wit as his guide—would be a raging success. And watching this film from director Lance Bangs, which follows the comedian on his West Coast run of dates, has proven me dead right. That one moment is a pretty fair approximation of how Barry handled most of his audience members, giving them enough rope before yanking it back with glee, from the mustachioed members of the Los Angeles band Avant Abstract (Barry: “I did my business cards in that font.”); to a budding comedian in San Diego that goes by the name Austin Train (Barry: “Are you any good?” Train: “Well, I’m no Todd Barry.” Barry: “Well, I know that.”); to Garth, the digital marketer for a soda company in Seattle (Garth: “It has 1/4 to 1/3 of the sugar in regular soda.” Barry: “So, it’s bad soda is what you’re saying…”). As I’m sure it went with every stop on the tour, not every moment of this hour-long film is golden, particularly all the interstitial footage of the drive to a show or Barry giving a tour of his hotel bathroom. Thankfully those brief scenes are pushed into the background thanks to Barry’s nimble and razor sharp repartee with a remarkably willing bunch of comedy fans and organic poultry lovers.